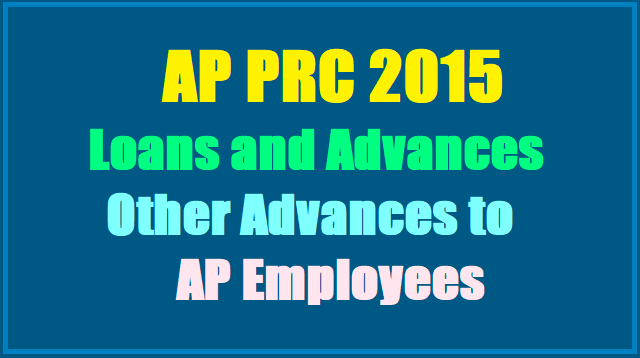 AP PRC 2015 Loans and Advances - Other Advances to AP Govt. Employees - Motor Car Advance, Motor Cycle/ Scooter, Moped Advance,Bicycle Advance,Marriage Advance, Personal Computer Advance,Festival Advance,Special Festival Advance,Education Advance. Loans and Advances in Revised pay Scales, 2015. AP PRC GO.167, Loans and Advances GO.167. LOANS AND ADVANCES -G.O.Ms.No.167 Dated: 20-09-2017-FINANCE (HR.VI-A&L-TA) DEPARTMENT A -dmissibility in Revised pay Scales, 2015 - Recommendation of Pay Revision Commission 2015- Orders - Issued. 1. G.O.Ms.No.175, Finance (A&L) Department, Dt: 15-05-2010. 3. From the Special Secretary to Hon’ble Chief Minister C.M.P.N625/Spl. C.S/2017, Dt: 22-06-2017 enclosing the representation of the Andhra Pradesh Secretariat Association, Dt: 09-06-2017. ORDER: In the Government Order 2nd read above, based on the recommendations of the Tenth Pay Revision Commission, Orders were issued implementing the Revised Pay Scales, 2015 to the State Government employees. 3. Government, after careful consideration of the Tenth Pay Revision Commission recommendations, and in modification of the existing orders in Government orders in the reference 1st read above, governing sanction of such advances to Government employees, here by enhance the ceiling as recommended by the Tenth Pay Revision Commission, as follows..
Officers whose basic pay is Rs.27700/- and above 15 months’ basic pay or Rs.4.50 lakhs or actual cost whichever is less Principal – 135 Interest – 65 8.50% p.a. Officers whose basic pay is Rs.37,100/- and above 15 months’ basic pay or Rs.6.00 lakhs or actual cost whichever is less Principal – 135 Interest – 65 a. For Class-IV -5.00% p.a. b. For Others - 5.50% p.a. Officers whose basic pay is Rs 11,530/- and above 07- months’ basic pay or Rs.60,000/- or actual cost whichever is less. Principal – 80 Interest –16 7.50% p.a. Officers whose basic pay is Rs.22, 460/- and above . 07- months’ basic pay or Rs..80,000/- or actual cost whichever is less. Principal – 80 Interest –16 a.For Class-IV - 5.00% p.a. b.For Others - 5.50% p.a. Officers whose basic pay is Rs.11530/- and above. All Drivers who have completed two years of service irrespective of their basic pay. 07- months’ basic pay or Rs.25,000/- or actual cost which-ever is less Principal – 60 Interest –16 7.50% p.a. Officers whose basic pay is Rs.16,400/- and above. All Drivers who have completed two years of service irrespective of their basic pay. 07- months’ basic pay or Rs.35,000/- or actual cost whichever is less Principal – 60 Interest –16 a. For Class-IV - 5.00% p.a. b. For Others - 5.50% p.a. All employees including Class-IV (except to those for whom advance for the purchase of Motor Car /Motor Cycle sanctioned earlier) Rs.5,000/- or Actual Cost whichever is less. Principal – 26 Interest –04 6.50% p.a. All employees including Class-IV (except to those for whom advance for the purchase of Motor Car / Motor Cycle sanctioned earlier) Rs.10,000/- or Actual Cost whichever is less. Principal – 26 Interest –04 a. For Class-IV -5.00% p.a. b. For Others - 5.50% p.a. For the marriage of male employees themselves or for the marriage of sons of the male / female employees. a. For Class- IV : Either 15 months’ pay or Rs.30,000/- whichever is less. b.For Others: Either 15 months pay or Rs.50,000/- whichever is less. Principal – 70 Interest – 10 1. Gazetted Officers – 8.5% p.a. 2. Non- Gazetted Officers – 7.5% p.a. 3. Class-IV employees – 6.5% p.a. For the marriage of male employees them-selves or for the marriage of sons of the male / female employees. a. For Class- IV Either 15 months pay or Rs.75,000/- whichever is less. b. For Others: Either 15 months pay or Rs. 1,25,000/- whichever is less. Principal – 70 Interest – 10 a. For Class-IV -5.00% p.a. b. For Others - 5.50% p.a. For the marriage of female employees them-selves or for the marriage of daughter of the male / female employees a. For Class- IV : Either 15 months pay or Rs.50,000/- whichever is less. b. For Others: Either 15 months pay or Rs.75,000/- whichever is less. Principal – 70 Interest – 10 1. Gazetted Officers – 8.5% p.a. 2. Non- Gazetted Officers – 7.5% p.a. 3. Class-IV employees – 6.5% p.a. For the marriage of female employees them-selves or for the marriage of sons of the male / female employees a. For Class- IV Either 15 months pay or Rs. 1,00,000/- whichever is less. b.For Others: Either 15 months pay or Rs. 2,00,000/- whichever is less. Principal – 70 Interest – 10 a. For Class-IV -5.00% p.a. b. For Others - 5.50% p.a. Employees whose basic pay is Rs.22,430/- p.m., or more. Rs.50,000/- Principal-135 Interst-65 8.50% Employees whose basic pay is Rs.16,400/- p.m., or more Rs.50,000/- Princip al-135 Interst- 65 a. For Class-IV - 5.00% p.a. b. For Others - 5.50% p.a. 4. In respect of all loans the penal interest will be charged at the double the rate of normal interest in case the advances are mis-utilized or not utilized at all and at 5 times the normal rates for non-compliance with formalities. 5. All other conditions governing the sanction of above advances under the existing Rules will continue. 6. These orders shall come into force from the date of issue of the G.O. AP PRC 2015 Loans and Advances - Other Advances to AP Govt. Employees - Motor Car Advance, Motor Cycle/ Scooter, Moped Advance,Bicycle Advance,Marriage Advance, Personal Computer Advance,Festival Advance,Special Festival Advance,Education Advance. Hi can u plz let me know if this G.O.167 is already in place or still it is pending for approval?